A book by Ernest Hemingway that was published in 1964 has shot up to the top of the bestseller list in France. 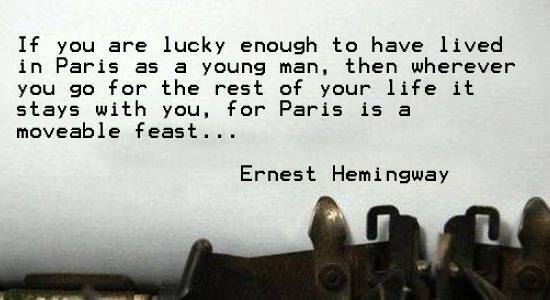 A Moveable Feast talks about the time Hemingway spent in France and how Paris as an exciting place of ideas, a nexus of people who love life and the arts. It is finding new readers and being left in tribute to those who lost their lives a week ago. Agence France Presse reports, “Paperback versions are being deposited, along with flowers and candles, in front of bullet-ridden windows at one of the Paris bars targeted by the jihadist gunmen.” They also mention that copies are also turning up outside the Bataclan concert hall. Ducreux added that Folio is already printing a further 20,000 copies of A Moveable Feast, with plans for a second reprint. The UK newspaper, the Guardian noticed that this wasn’t the first time Parisians have turned to bookshops in the aftermath of a terrorist attack. In January, after 12 people were killed at the offices of the satirical magazine Charlie Hebdo, Voltaire’s 18th-century Treatise on Tolerance topped bestseller charts in France.